Castle Cove sailing club was the excellent venue for the last official moth training bootcamp of 2012. What a great location, with residues of the Olympic atmosphere still ringing in the air. 14 boats and their pilots arrived on the saturday coming from as far afield as York and Ullswater in the lake district. Of course the biggest topic of the weekend was foil gybing and coach Peter Barton (UK speed record holder) was in charge of delivering the seminar. We were also fortunate enough to have our current European champion Chris Rashley drop in and share with us his methods and techniques by way of some of his personal on board videos. Anyone who has sailed at Weymouth knows what an excellent playground it is for moth sailing and we were not let down. Saturday saw 10 knots in the morning building to 15 knots in the afternoon, butter flat water and full sunshine all day, perfect for getting gybe practice in. 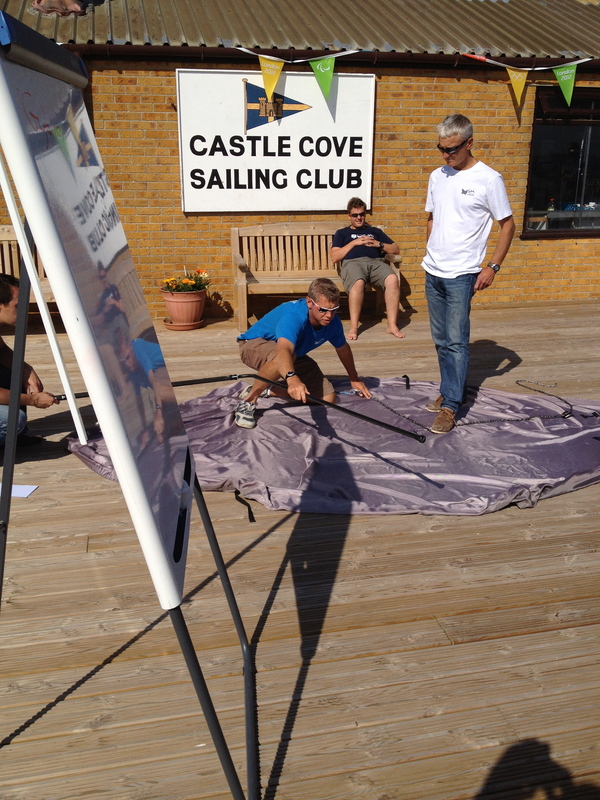 Peter set up a very short windward leeward course with the minimum requirement being three tacks and three gybes. There were plenty of crashes but there was also a marked improvement in the hit rate with many finally achieving their first fully foiling gybe. A quick break for tea and cakes and then it was back out for more short windward/leeward sailing. Of course some of the more experienced sailors couldn’t help themselves and at the front of the fleet it soon became a mini regatta with Gareth Davies in fine form in his new Exocet moth followed by Simon Hiscocks, Phil Oligario and Richard Edwards in their homebuilds along with Neil Baker in his Mach2. Saturday evening was hosted by Castle Cove Sailing club and Ric Bowers and his team organised a fantastic barbeque with plenty of beer! Sunday again delivered excellent conditions if not a little more challenging with winds gusting in the late teens at times. Ricky Tagg was head coach for the day and his focus was on boat set up and mental attitude. Ricky and Phil had a look around some of the older boats and were immediately able to spot problem areas that once rectified would transform the boats and lead to higher success rates when trying to foil. With the same format as on Saturday, we saw most of the 14 boats attempting the short course even in the increased breeze. We were also joined by a few more boats and saw the likes of Jeremy Hartley (Stokes Bay) successfully pulling off a few very smooth gybes in his Mach 2. Gareth Davies was happy to report a top speed of over 27 knots! Simon Hiscocks was heading up the new school “aussie” approach to driving these boats hard with some exceptionally “committed” gybing which some of our top sailors should be looking to adapt moving forwards. Finally after another long day on the water everyone came ashore to pack up and reflect on where to go from here in terms of boat set ups and taking what was learned from the training camp. Thanks to Peter Barton, Ricky Tagg and Phil Oligario for providing all of the coaching and technical advice. Special thanks to Helen Rollinson and Castle Cove Sailing club for their excellent organisation and hospitality. Of course there is no let up for them as they play host to the UK Moth class’s first Grand Prix event of the new series (2012 – 2013) next weekend (22nd/ 23rd Sept) which promises to be an excellent event at a great location!